Sting.com > News > Countdown to Rock Paper Scissors! Rock Paper Scissors – the summer tour featuring two of the world's most iconic artists, Sting and Peter Gabriel – starts its trek across North America tonight at Columbus, Ohio’s Nationwide Arena! 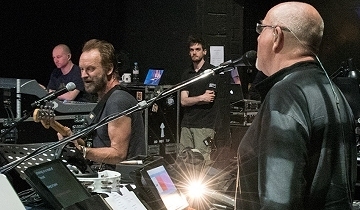 Both Sting.com and PeterGabriel.com will keep you up to date with news, reviews and photos from the tour and there are several ways you can help! Be sure to use the hashtag #RockPaperScissors on any Facebook posts, Instagram snaps, tweets and photos you post so fans everywhere can view and share. And remember, you can post your comments, photos and copies of your ticket stubs to the tour pages at http://www.sting.com/tour. There are still a few tickets up for grabs, so check out http://www.sting.com/tour, http://www.livenation.com or http://www.ticketmaster.com now to make sure you don’t miss out on what is sure to be an unforgettable summer of music! Photos by Tony Levin from his web diary at http://tonylevin.com.